Be warned, if you haven't seen The Amazing Spider-Man 2 there will be massive spoilers throughout this article. Read on at your own risk. Fans who saw The Amazing Spider-Man 2 in theaters this past weekend got brief glimpses of the franchise's upcoming expanded universe, with a look at some of the villains to be included in The Sinister Six spin-off. Director Marc Webb reveals in a new interview with Grantland that he spoke to The Sinister Six writer-director Drew Goddard about where the story will go from here, while hinting at specific plans for Doctor Octopus and Vulture. "I had to talk to Drew Goddard (The Sinister Six writer/director) and make sure these things were going to be played out in the future universe. 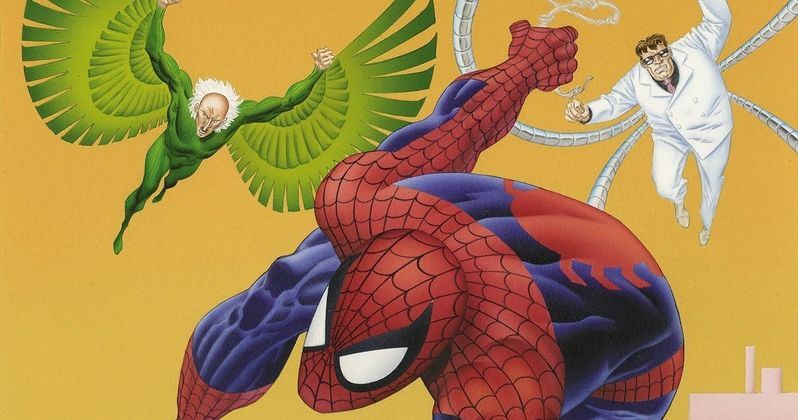 There are some very specific plans, for example, for [Doc] Ock and for Vulture. Or the man in the hat at the end of the first movie. All those things emerge with varying degrees of emphasis." The "man in the hat" that fans saw in The Amazing Spider-Man has been confirmed to be Gustav Fiers, a.k.a The Gentleman, who puts together The Sinister Six in the later iterations of the super villain group in the Marvel comic books. While it still isn't known who is playing this character, it seems he will be the one responsible for the formation of The Sinister Six, instead of Doctor Octopus, who gathers the team together in the original storyline. The Amazing Spider-Man 2 also featured another iconic moment, the death of Gwen Stacy (Emma Stone), which the marketing for this sequel has hinted at for months before opening. An earlier draft of the screenplay, written by Jeff Pinkner, Roberto Orci and Alex Kurtzman, featured the inclusion of Mary Jane Watson, who was played by Shailene Woodley, although her scenes were ultimately cut from the finished product. Jeff Pinkner revealed that it was a mistake to bring Mary Jane in this early. "It was our mistake to try and introduce Mary Jane too early." Director Marc Webb elaborated that, to reveal another potential romantic prospect would have tarnished Peter and Gwen's relationship. "To hint that there was [another love interest], to put that in the water, I think would have tarnished the sacred sort of bond that these people had. By the end, Peter Parker can only see [Gwen Stacy], and you have to preserve the integrity of that." Marc Webb also spoke briefly about The Amazing Spider-Man 3, which will be the last movie for both the director and star Andrew Garfield. Here's what he had to say about the story, which explores whether or not Peter will be able to love again after losing Gwen. "Will Peter Parker love again? When [relationships] end, it's very difficult to imagine emerging from that. I think that's, emotionally, where he's going to start off in the next movie." Do you think we should see Mary Jane Watson in The Amazing Spider-Man 3? Or is it too soon after Gwen's death? Chime in with your thoughts below.